Off the cruisers' beaten path, the City of Belfast has often been referred to as a hidden gem for boaters. 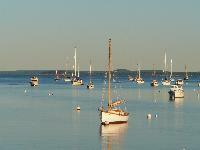 Away from the crowds and traffic, this very friendly Maine coastal community offers everything a boater needs, from provisioning to vessel service. The harbor is within walking distance of the Belfast City Landing. In addition, visiting boaters also enjoy the shorefront public parks and strolling just up the hill to the many fine restaurants, art galleries, farmer’s market, movie theater, pubs, shopping, and much more, again all within a short distance of the water.